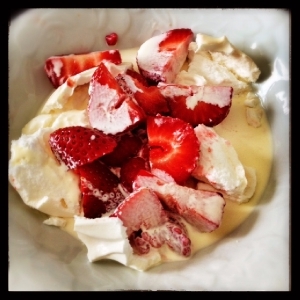 This is a very, very simple idea (that no doubt a lot of you have tried out before) but as I have whipped the meringues out the cupboard quite a few times in the past few weeks I thought I would share. It’s so easy to keep a pack of these meringues in the cupboard as a ‘just in case’ and because other people usually have cream in for their cakes and I always have fruit in the fridge, this dessert is always on hand to whack together! It’s so sweet and delicious and I never feel deprived of a dessert once it’s consumed and best of all its only 4sp!! Winner!! You can add to this recipe as you please, sometimes I add a few tbsp of fat free strawberry yoghurt and some banana too! Whack in a bowl altogether, mash together a bit and enjoy!!! !